Plan an excursion to the Palmer House, a Hilton Hotel and book the Leisure Escape package to receive a $50.00 per night credit. Then, use your credit to to amplify your adventure! Use your $50.00 per night credit at the hotel to dive in to Potter’s Chicago Burger Bar and take a journey across the city through a burger menu that will delight! From the gooey cheese-curd melted madness of the #7 Lakeview burger, the hearty Wicker Park/Bucktown veggie black bean burger, to the #8 smoky Logan Square combining aged cheddar with bourbon bacon and bbq aioli – you’ll be in Chicago burger heaven. Or, pamper yourself and use your daily $50.00 credit on relaxation services at The Spa at Palmer House, located on the 5th floor. The Spa at Palmer House combines all aspects of spa, beauty, and wellness to create a full service menu with both classic and trending services. 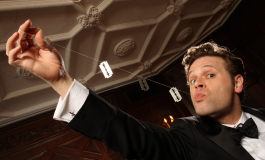 Enjoy the Award-winning, third-generation magician, Dennis Watkins for mind-blowing magic and mind reading amongst the historic backdrop of the Palmer House, a Hilton Hotel. An interactive luncheon and behind-the-scenes hotel tour lead by hotel historian, and Director of Public Relations, Ken Price who navigates guests through the hotel highlighting the art-deco lobby, grand ballrooms, and vintage artifacts showcased throughout the famed property. These sites aren’t typically open to the public, so guests on the tour will have an exclusive insider view. 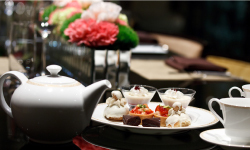 Enjoy Afternoon Tea, served in the historic lobby of the Palmer House, a Hilton Hotel.